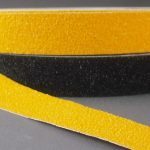 Ideal anti-slip (non-skid) floor grip tape for use on irregular surfaces and can be hammered into place. It’s especially good for use on Diamond Plate. A mallet (not supplied) and the adhesive backing cause it to adhere to the contours of the surface. 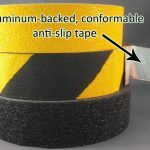 We only have four of these rolls in stock (two in black and two in black/yellow hazard) at this special price, but can order more if desired. 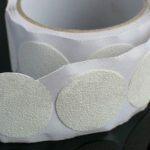 Easy to apply: peel-off adhesive backing. Built to last for any indoor or outdoor use. The abrasive is durable aluminum oxide. Helps assure ADA and OSHA compliance. 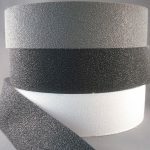 Ideal anti-slip (non-skid) floor grip tape for use on irregular surfaces and can be hammered into place. It’s especially good for use on Diamond Plate. A mallet (not supplied) and the adhesive backing cause it to adhere to the contours of the surface. We only have one of these rolls in black and two in black/yellow hazard in stock at this special price, but can order more if desired.